Flitto, a SpringBoard London graduate has the Gangnam style for sure, that’s because they are based in Gangnam South Korea. They are truly rockstars for graduating from SpringBoard London which has become TechStars. 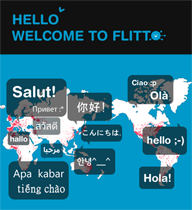 Flitto serves up translation from the crowd, making it easy to get quick, real life translations on content rather than mechanical translations which can sometimes leave the user just as lost as before the translation. “The language barrier can be broken down by hiring professional translators. But we’ve tried to be smarter than that. We can get rid of the language barrier without hiring one single translator just by using the greatest tool humans have ever made – the Internet.” Lee said on the SpringBoard/TechStars London Blog. We got a chance to catch up with Lee at the SXSW Interactive Tradeshow in the Gangam Style startups showcase. We’ve got more TechStars coverage here.